Frechman Christian Dewaet and his team drove 399,8 kilometers in a 1.2 manual Space Star to test the car's fuel economy during 48 hours. Watch the video for the result! The journey took place in the Var (in the south of France) between Cassis and Cagnes sur Mer. The maximum speed was 130 km/h. "The result is surprising for this new model, which is not at all short of breath" (5,28 l/100 km / 44.5 mpg US). Last edited by talldino; 04-01-2013 at 08:36 AM. I had bookmarked this to post today! Your "today" came earlier than mine. We took advantage of Mitsubishi press/media testing in the Var region to test for ourselves the fuel consumption of the 1.2L car over 400 km (249 miles) driven "normally" at 130 km/h (81 mph) on the Var motorways, and at posted speed limits elsewhere. The overall result is surprising for this new model, which did not feel "winded" ... Hint: this model consumes about 22% less than a VW Polo with the same power, from 20 years ago. - in these conditions, what's the advantage of a hybrid of the same class? note the freeway speed limit! 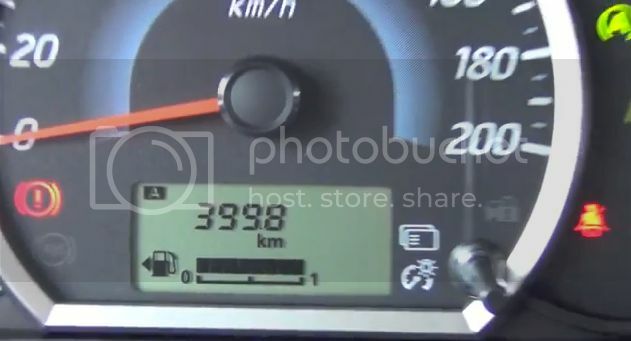 The fuel consumption numbers may not seem very impressive until you note that 45% of the round trip was on the freeway where they followed the 130 km/h speed limit (81 mph). Yeah, that surely is impressive mileage for that high of a speed. Did you notice the red sign at the petrol pump? "Pré-paiement en boutique". The French and their English translations.... I couldn't believe my eyes, but there is was: "Pay before into the shop"
Yes! I did notice that and had a laugh. That is good economy wonder how many klm were on the engine. There is some great shots on that vid.